We want to remind you that there will be no mail service tomorrow Wednesday. The U.S. 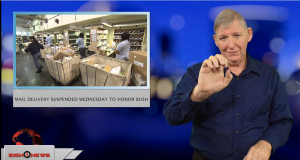 Postal Service is suspending regular mail deliveries on Wednesday to honor President George H.W. Bush. US postal retail services and offices will also be closed. But the service will still do limited package deliveries to prevent interruption in its holiday season operations.